Since I got back from Ireland, I’ve been holed up in my room panicking about the three papers I have due on May 16th that count for the entire grade in the three classes that assigned them. One is 3000 words, two are 3500, and they all involve reading way more journal articles than I could ever be bothered to actually print (especially considering how many trees those hundreds of pages would kill and how unbearable the cost would be considering this school isn’t on the free printing bandwagon). So what’s a lazy, eco-conscious girl to do? I need to highlight and underline things or I’ll spend all of my time sifting through dozens of articles trying to find that one quote that one person said instead of actually writing, so reading the PDFs as they appear on JSTOR or whatever is out. I really try to avoid reading on my computer because whenever I’m on my laptop I inevitably swipe back over to Facebook/Tumblr/Twitter/my Arrested Development marathon on Netflix/literally anything other than schoolwork, so reading and marking my PDFs on Preview doesn’t work either. Luckily, my stupidly awesome parents gave me an iPad last Christmas, so that lets me sorta-kinda get away from my distracting laptop, but I learned quickly that importing PDFs into my iBooks library just brings me back to the “help! I can’t highlight anything!” problem. The solution, after some extensive Googling? iAnnotate. I was apprehensive at first because of the $9.99 price tag (I mean, honestly, who pays for apps that aren’t the ad-free version of Words With Friends? ), but after reading dozens of great reviews I ended up taking the plunge, and thank God for that. This app is saving my life, I swear. First of all, it’s really easy to get started and get all of your documents organized. You can import files from Safari, or from your email, or from Google Drive or Dropbox or SkyDrive. There’s even an in-app browser to nab something from a quick Google Scholar search. Once you’ve got your files downloaded, you can sort them to give priority to ones that have already been annotated or that have yet to be read and organize them in folders or with tags. When you’re set up and ready to read, the reading experience is similar to what you’d probably expect from iBooks or Preview or whatever, but the annotation tools are what make the app (I mean, I guess that’s to be expected from something called “iAnnotate”). You can type in notes, scribble in notes (a feature intuitive enough for even my scrawl to end up legible on the page), choose from two(!!!) different highlighting tools, underline, and use a pencil tool to draw brackets or whatever other nonsense you might like to put all over your articles. You can even add in audio or photographic notes. It’s the best tool I’ve found to recreate the experience of actually reading and annotating a hard copy of a paper, and with high-tech options like those audio notes (sometimes I have random streams of word-salad inspiration that pass before they can be translated into coherent writing, so I’m a huge fan of being able to just blurt that at my iPad) and being able to search through an article or your entire library for key words or phrases when seeking an elusive quote, it even surpasses the old-school method in some ways. As with any app, there are a few drawbacks. 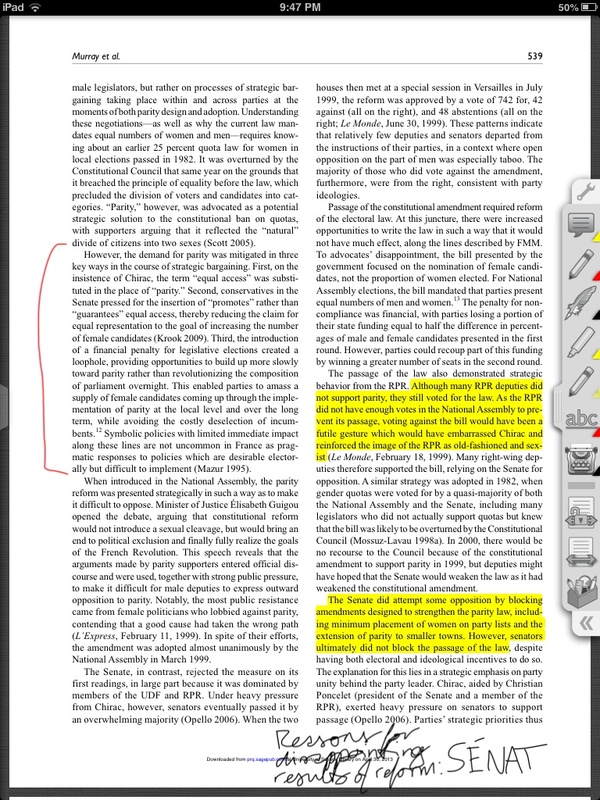 When I first started using the app and didn’t notice that there were multiple ways to highlight, I got frustrated when a PDF with weird typesetting didn’t play nice with the primary highlighting tool. Also, the app doesn’t have an iPhone or Mac counterpart, so if you haven’t joined us spoiled upper-middle-class Apple-philes in the iPad nation yet, you’re out of luck (well, unless you’ve got an Android tablet — more on that in a second). Also, you know, this thing costs 10 bucks, so if you’re not in a field of study or line of work that’s going to have you knee-deep in journal articles on the regs it might not be worth the investment. However! Android users, as of when I’m writing this post, your version of iAnnotate is free. It appears that it may be a beta version or something, since the website alludes to a full version of iAnnotate for Android “coming soon.” But it lists the free version as an “introductory offer,” so maybe the full version of it will just be released as an update and you’ll end up with it for free. I have absolutely no idea how the life cycle of an app works. My computer literacy extends only as far as the HTML necessary to build basic PetPages on Neopets circa 2004. In any case, it’s worth a download. So that’s my love letter to iAnnotate. Full disclosure: the whole time I was writing this post, my iPad was on my lap with an annotated PDF of “Fifty Years of Feminising France’s Fifth Republic” staring up at me. I should maybe probably definitely get back to writing my Politics of France paper.